Perfect for topwater bites, the Big Bite Tour Toad provides the buzzing action your looking for. Made with serrated legs, the Tour Toad catches more water and produces a louder buzzing sound than any other soft body frog. The flat body also planes quickly and allows anglers to use a slower retrieve to stay in the strike zone for a longer period of time. Spot for a top hook allows perfect weedless rigging. 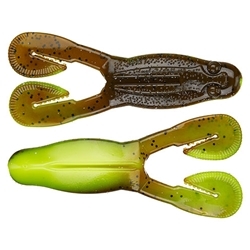 Can be rigged with your favorite double frog hook, weightless screw-lock, or ewg hook. This is the bait you won't regret having in your boat on game day!